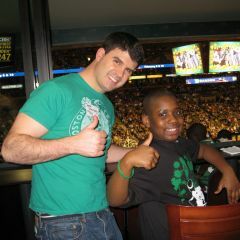 Did you know that we have hundreds of children in Greater Boston on our waiting list looking for a mentor? Research shows that volunteers who were referred to our program by their friends (active or alumni Bigs) are more likely to get matched and have longer impactful matches. The kids on our waiting list need your help. What should I say about being a Big and the organization? Jared Steinberg has been matched to Tyrone since 2011. He has also referred many volunteers that have led to more children getting Bigs. How do you know a great potential Big when you meet one? Think about yourself, your friends, family, colleagues, and the other Bigs you know. There’s no cookie-cutter age, ethnicity, education level, lifestyle, or background for volunteers and the majority of your loved ones and co-workers would likely be a perfect fit for our program. Be yourself, say what feels right and explain what you do with your little. Share your experiences with the process. Share the impact you have had personally & professionally, and focus on the fun aspects of being a Big. Share funny stories/experiences, photos, the nostalgia you’ve felt from your own childhood, the list goes on. Time: A few hours, twice a month, for one year. That is seriously all it takes to be a Big. Cost: The program only costs as much as YOU want it to. Being a Big is about doing the simple and invaluable things that money can’t buy. This can even help your Little in learning how to have fun within a budget that is realistic. You’re not a parent: As a mentor, you aren’t a surro­gate parent or a babysitter you’re a friend that happens to be an adult role model and the organization works really hard to help you develop a relationship that’s comfortable for everyone involved. We propose matches based on shared interests: We have a careful, thoughtful process of matching Bigs and Littles that share similar interests and have fitting personalities. Ultimately, our volunteers and families will decide to work together. The choice is yours! Share a photo of you and your Little doing something fun together. Pictures are powerful! “No pressure, but if any of you out there are interested in Big Brothers Big Sisters, please let me know! They are always looking for Bigs and if I can help one more kid like my Little Brother/Sister _________, it’ll all be worth it”. Post stories of your experiences for all your friends to see in real-time what it’s like to be on an outing. Video of what you’re doing. Have your Little say something to your friends about how fun it is having a Big. Just wanted to follow up with you per our previous conversation about Big Brothers Big Sisters of Mass Bay. I really think you’d have a lot of fun and you’d be a great fit. Let me know if you want more info and I can send you to the right people. As you know, I’ve been a Big Brother/Sister for a few months now, and they are looking for more Bigs to volunteer. I really think you’d have a lot of fun. [Insert Info about your Little and how you have liked the program so far]. Let me know if you want any more info about it or have any questions. Their website has a lot of good info too. Check it out! https://www.bbbsmb.org/volunteer/why-become-a-big/. As you know, I’ve been a Big Brother/Sister for a few months now, and they are looking for more guys to volunteer. I really think you’d have a lot of fun. [Insert Info about your Little Brother and how you’ve like the program so far]. Let me know if you want any more info about it or what you think? Their website as a lot of good info too: https://www.bbbsmb.org/volunteer/why-become-a-big/.